The Book on Small Business Ideas is set to launch on December 21, 2017. In this post, you’ll find all of the details you need, including a book overview, video, audio, table of contents, and more…diving into what you can expect from this game-changing book. 2 Video: are you ready to become unemployable? 5 What are the pros saying? 6 Ready to get The Book on Small Business Ideas? My first book Leave the Grind Behind gave you the concepts, building blocks, and motivations to quit your job, make money on your own, and live a more fulfilling life. This new book is more of a tactical and strategic dive, giving you specific approaches to creating and successfully launching your own simple side hustles, money machines, and small businesses. 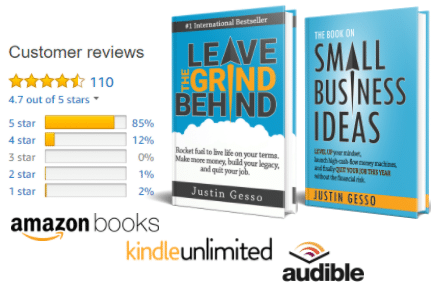 The Book on Small Business Ideas is complimentary to Leave the Grind Behind. It is the next logical step for most readers. The Book on Small Business Ideas: Level up your mindset, launch high-cash-flow money machines, and finally quit your job this year without the financial risk. Understanding your personal drivers, allowing you to generate ideas that achieve your goals. Finding your personal motivation to actually see your ideas through to reality. Evaluating your small business ideas and side hustles against real-world criteria to determine success potential. Launching your ideas effectively in today’s competitive environment. The Book on Small Business Ideas is filled with exercises to help you find your passion, generate momentum, and stand out from the crowd. The concepts in this book won’t put you at risk, and they won’t be complicated. Video: are you ready to become unemployable? Here’s a short video that positions both books. Do you relate? If so, The Book on Small Business Ideas may be just what you’re looking for. What are the pros saying? “There is no shortage of small business ideas or side hustles. But there is a shortage of people who have been able to find their own perfect idea and see it through to success. 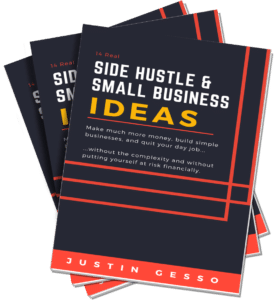 Ready to get The Book on Small Business Ideas? For the special pre-release deals, make sure to get on the pre-release list here. And you can purchase The Book on Small Business Ideas here on Amazon.